Aqualand is a custom fabricator since 1959 with a specialty line of Marine Products for docking purpose. The quality of our products along with our Lifetime Warrantee has attracted customers for 48 years. The simplistic design and ease of operation stands us apart from other companies in this Market. 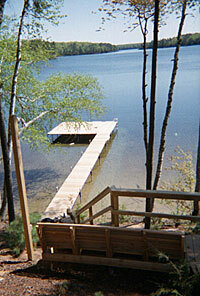 Our current docks still fit and works in conjunction with the ones we manufactured over 40 years ago. The customers in our Marine or Dock business are generally private Consumers, but Aqualand Manufacturing of Woodruff, Inc. has, in our material handling business, also built for larger cities like Milwaukee and New York. The National forest, National Guard, U.S. Post Office and other fortune 500 companies also purchase our products through the distributor we develop and manufacture products for. Aqualand ships product nation wide to all 50 States, including Hawaii. Special orders have been sent as far away as Iraq.